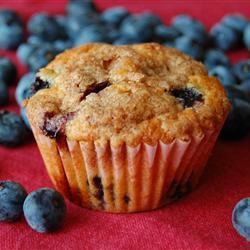 Blueberry Muffins - Stop looking for great blueberry muffins, these are delicious! Mash 1/2c blueberries and stir in by hand. Add rest of blueberries, whole. Fill muffin cups high and sprinkle with sugar. Bake 375 F, 25-30 minutes. Remove from pan carefully.